11/25/18: Turkey Bones and Backyard Homes Build Our Future! As we head toward year’s end, my thoughts turn to the areas that we’ll be tackling with renewed vigor here at City Hall in 2019. After reading about these developments below, you might get a better idea about why I’m so optimistic about the future of Encinitas! I’m excited about the roll-out of our pre-approved accessory dwelling unit plans – a very important piece of our housing approach. On Jan. 9th, the City Council will hear a preview, and on Jan. 22, Encinitas will hold a public workshop to unveil the opportunities. Two local architects have developed eight different floor plans, from studios to three-bedroom designs. Using a pre-approved plan to build an accessory unit or granny flat should dramatically reduce the plan check and city processing review time. The point is to reduce costs, barriers and friction to allow homeowners more flexibility to provide additional housing, plus potential rental income. Experience has shown me that our city’s approach to housing is like an elaborate jigsaw puzzle. When any individual piece is viewed alone, it’s hard to see the pattern. But when looked at as a whole, the “backyard homes,” or accessory unit pattern, is a critical and major element of the puzzle. After a lot of work, this particular piece of the housing puzzle is reaching the finish line. How many mayors do you know who’ll show you their personal compost bucket? 🙂 This one comes from the Solana Center for Environmental Innovation. I’m very enthusiastic about the emerging landscape related to the handling of food waste. We’re getting involved at multiple levels to help move the ball forward on reducing food in the landfill and finding the beneficial re-use potential. 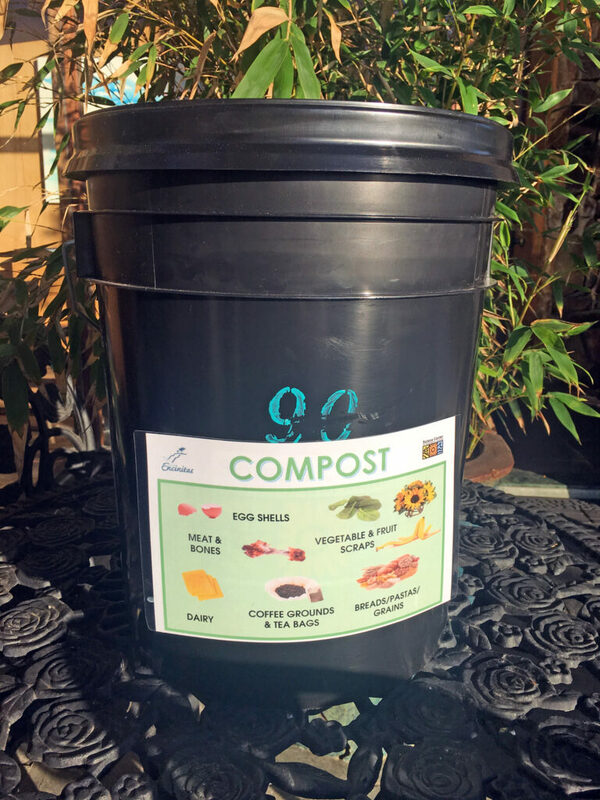 At City Hall, we’re doing a composting pilot project where city employees put food scraps into a bucket with a compostable “non-plastic” liner. Then our Climate Action Coordinator Crystal Najera gathers the bags into a bucket and sprinkles a bran mixture onto the top, which helps the compost ferment. She takes the sealed buckets to the Solana Center, where they compost it. Fermenting (think kombucha) is the foodie-rage right now. I find it really interesting that it’s also a new way to manage food scraps through the process known as Bokashi. Because it ferments, you can put meat and dairy into the compost, something typically avoided with home composting because it attracts vermin. On December 12, the first meeting with our new City Council, Solana Center Executive Director Jessica Toth will give a fascinating presentation on the status and realities of composting and food waste management in our city and county. As a member of the “Regional Solid Waste Association” board, I heard Jessica’s presentation and asked her to give a modified version to the council because it’s so informative. It will happen near the beginning of the meeting and you can watch it on TV or at this City of Encinitas link. The Solana Center is offering composting classes here. And I highly recommend this remarkably emotional, short video of the riveting story of a strawberry, driving home the need to reduce food waste. Just watch it! Remember when recycling plastic and glass was not part of our waste management system? Well, I believe we’re in that pre-recycling time right now when it comes to food waste. At the Encina Wastewater Authority, in the new year we’ll be hearing an evaluation of whether food waste can be turned into useable natural gas at the Encina plant. 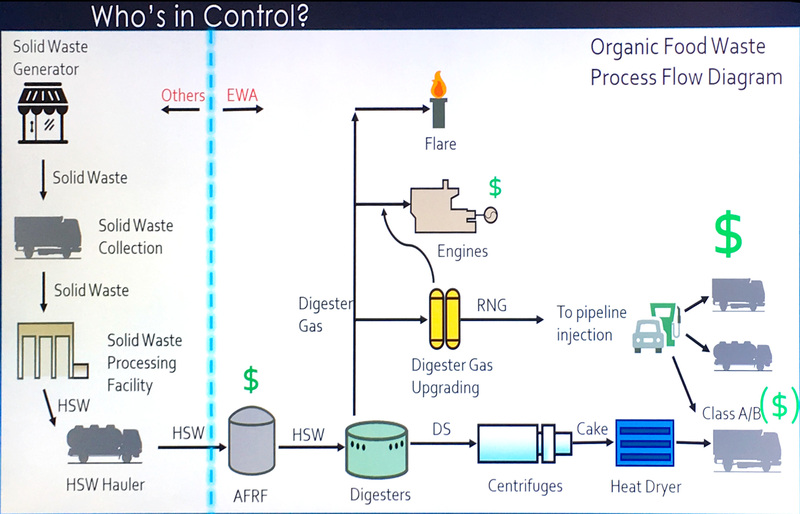 The chart above shows, from left to right, the complexity in the “High Strength Waste Feasibility Study” that would allow Encina to turn organics into fuel. Cities are mandated by state bill AB 1826 to decrease the amount of organics being sent to landfills. This requirement can’t be met with the existing infrastructure available from waste haulers, composting facilities or wastewater treatment plants. So some agency or a combination of agencies will need to fill the void. Our waste hauler EDCO will have a food digester coming onboard soon, but it can’t handle all the regional supply of food waste. Encina treats wastewater from 400,000 people in Encinitas, Carlsbad and Vista. They are centrally located in Carlsbad and could help provide part of the regional solution for the diversion of organic waste away from landfills to be beneficially reused. Encinitas is a city that cares about both greenhouse gas emissions and sustainable practices. Just as we’re doing more than what’s required in our liberalization of regulations around accessory housing units, we’re jumping into food waste management with similar enthusiasm. We’ve also formed a subcommittee of Deputy Mayor Joe Mosca and me to plan a Food Waste Summit for the spring. Good luck to Tasha and Mark; hello Jody and welcome back Joe! At this week’s city council meeting at 6 p.m. on Wednesday, November 28 at City Hall, we’ll be honoring outgoing Councilmembers Tasha Boerner Horvath, who’s headed to the state Assembly, and Mark Muir, who’s dedicated many years of service to the community. You’re invited to join us for the recognition. And on Tuesday, Dec. 11th at 6 p.m., we’ll have a special council meeting to swear in Joe Mosca and Jody Hubbard as councilmembers with four-year terms, and me as your mayor with a two-year term. Please join us for this happy occasion! I hope you enjoyed the Thanksgiving weekend as much as I did. 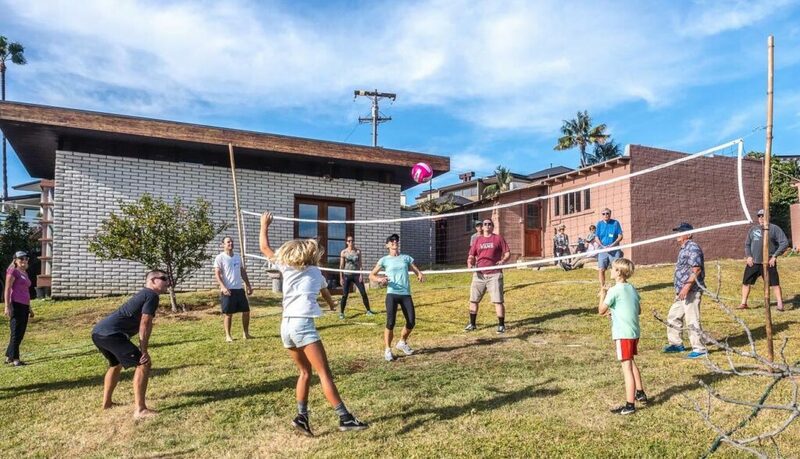 Our traditional family celebration with a volleyball game (captured above by my uncle Raymond Elstad), 23 guests for a pot-luck feast, and after dinner talent show, was meaningful and soul-nourishing. I truly loved the preparation, the day itself and also the cleanup. It’s a whole process from beginning-to-end, just like life! Soon we’ll be in the final month of 2018, and by now you can probably tell that I’m enthusiastic about where we are as a city and a community. I’m looking forward to the projects and opportunities that await us. We’re on solid ground and we’re poised to make some very exciting improvements. P.S. 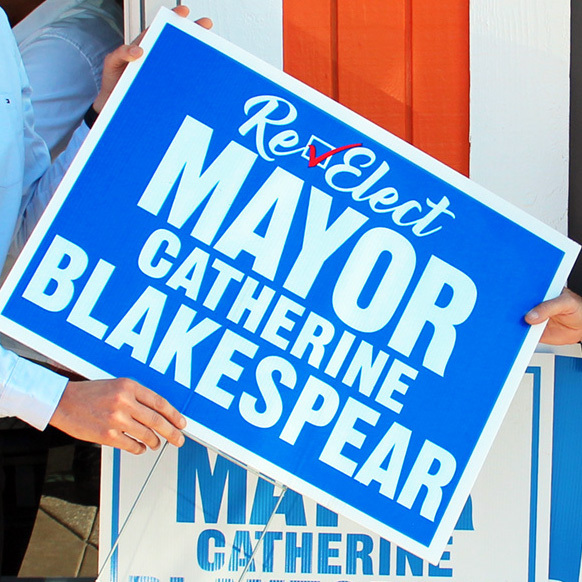 And speaking of re-use… Congratulations to Marilyn Gold, who recycled her “Re-Elect Catherine Blakespear” sign at GOODONYA Organic Eatery and won the random drawing. She and her husband Mickey will be joining me and a guest for a delicious dinner there. Thanks to everyone who returned their yard signs – I’m looking forward to using them again in 2020! Previous Post11/18/18: When We Work Together, Things Work Better!Next Post12/2/18: How Far Will the Court Go to Remedy Our Housing Impasse?